In 1972’s The Godfather, Don Vito Corleone promises Johnny Fontane he shouldn’t worry about a particular problem with a Hollywood producer because he’s “gonna make him an offer he won’t refuse.” For his powerful performance as the head of an organized crime family, Marlon Brando won the Academy Award for Best Actor. Interestingly, nearly 20 years earlier, Brando won his first Oscar for his portrayal of Terry Malloy, a washed-up prize-fighter-turned-enforcer for corrupt union boss Johnny Friendly, played by Lee J. Cobb. in her big-screen debut), Best Screenplay (Budd Schulberg), Best Director (Elia Kazan), Best Art Direction, Best Cinematography, Best Film Editing, and last but not least, Best Picture! Also nominated was composer Leondard Bernstein for his moving score, and no less than three Hollywood heavyweights were nominated for Best Supporting Actor: Lee J. Cobb, Karl Malden, and Rod Steiger. Made in 1954, when much of Hollywood was increasingly enamored with widescreen formats and color film, On The Waterfront owes some of its success to the fact that it was made in black and white and shot in a traditional, squarer format. The smaller window through which we view the story gives the film a heightened sense of desperation. We are trapped within the confines of the frame even as we watch the hopelessness of the lives of the longshoremen, trapped in a lifestyle barely capable of sustaining life, and one that offers little in the way of creature comforts or even anything resembling human dignity. The corruption rampant in the union is a constant reminder that they are beggars for their daily bread, husbands and fathers humbled and humiliated into hellishly long and hard hours of indentured servitude in the back-breakingly hard work of loading and unloading the huge ships that come into New York. Harsh shadows and dramatic lighting have noir overtones, and there is an underlying grittiness to the film that is achieved because of Kazan’s decision to shoot on location and populate much of the background with real people from the neighborhoods of New York. The fact that it was brutally cold during the filming, much of which takes place outside with an unforgiving wind rolling across the winter river, adds a palpable layer of discomfort to the already real performances. The story opens with Terry Malloy getting his marching orders from Johnny Friendly to get one of the dockworkers, Joey Doyle, to come up to his tenement rooftop so Friendly’s boys can “lean on him,” because he is set to testify against the teamster boss. Malloy does as he is told, but quickly realizes his actions led to the death of Doyle. 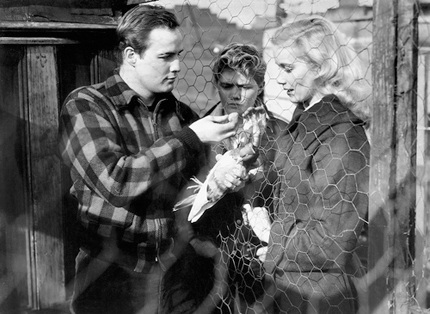 Malloy meets Edie Doyle (Eva Marie Saint), who is understandably distraught over the senseless death of her brother, and he begins to look at his life from a different perspective for the first time. His already complicated relationship with Edie is further complicated by the involvement of Father Barry (Karl Malden), the local Catholic priest who decides to finally step outside the comfortable confines of his church to intercede for his put-upon parishioners. If that’s not complicated enough, Johnny’s right-hand-man, Charley “the Gent” (Rod Steiger), is Terry’s older brother. As Terry’s conscience and his feelings for Edie begin to make him question his loyalties, Johnny forces Charley to reign his brother in — or else. This leads to one of the most famous scenes in the film, and indeed, one of the most memorable moments in motion picture history. Charley and Terry are seated in the back seat of a cab, and Charley pleads with his younger brother not to testify against Johnny in court, as Terry has recently been subpoenaed by the waterfront Crime Commission. He desperately tries to convince Terry that he owes Johnny a debt of gratitude for taking care of him for so many years, and he laments that Terry’s boxing career was ruined by his worthless manager. In this tense but tender moment, Terry comes to a realization that he has long put his trust in the wrong people, and that his own brother is responsible for the dead-end path he has blindly followed. Charlie: Look, kid, I — how much you weigh, son? When you weighed one hundred and sixty-eight pounds you were beautiful. You coulda been another Billy Conn, and that skunk we got you for a manager, he brought you along too fast. Terry: It wasn't him, Charley, it was you. Remember that night in the Garden you came down to my dressing room and you said, "Kid, this ain't your night. We're going for the price on Wilson." You remember that? "This ain't your night"! My night! I coulda taken Wilson apart! So what happens? He gets the title shot outdoors on the ballpark and what do I get? A one-way ticket to Palooka-ville! You was my brother, Charley, you shoulda looked out for me a little bit. You shoulda taken care of me just a little bit so I wouldn't have to take them dives for the short-end money. On The Waterfront is a beautiful film, despite (or perhaps because of) the ugliness of its backdrop and the coarseness of its characters. Ultimately, this is a powerful and poignant tale about people who make choices, sometimes seemingly small and insignificant choices, and how those decisions are compounded over time until they become chained to their consequences. But it is also an essay in courage, and the portrait of a man in pursuit of redemption. This is a film that is always ranked near the top of greatest-movies-ever-made-lists, and for good reason. It’s a contender because it’s a story with class. It represents some of the very best work of some of the very best craftsmen Hollywood ever produced, in front of and behind the camera, and it’s a virtual workshop on how to make a perfect movie. And nearly 60 years later, it’s still relevant, still moving, and still worth watching.